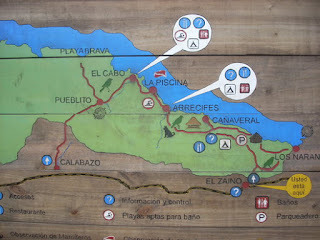 I arrive at Santa Marta and I go direct to Taganga by motorbike. Taganga us a smal village next to the beach, fisherman's and gringos. I have arrived to the Colombian Caribbean sea. After choosing a hostel ( I choose the Ocean Reef hostel, smal and cheap) I go for lunch and also to watch the final of the European Super Cup... Barça wins!!!! The night bus ride leave me without energyt, I rest for a bit at the hostel. When the sunlight disappears, I go for diner with three Chileans girls that stay as well at the hostel. There is some Gringo party like Salou (summer cheap holiday destination)... I have enough of Taganga. Early morning I go to Santa Marta with an light backpack for a three days trekking in the Tayrona National Park. I buy food and water before I take the bus to the Park. This is spectacular pretty. The sea, the jungle and the mountains goes toghether and even the high number of visitors still maintain some virgin spirit. In Barichara you can see a village with that takes care of the town... you can see restored houses, painted white and blue and a streets with a very relaxed atmosphere. After find accommodation in a residence pretty goodl, I go for a walk to see the town at night and eat something. Bogotà and wedding at Espinal! At the hostel I see that I have a missatge on Facebook of Ana Milena (the Colombian girl that I meet in China one year ago). This weekend is in Bogota and we said that we could meet. She have party with her friends and she invites me... Of course I go! After find the apartment, I meet again with Ana (after a year I haven’t go back home, and I’m meeting people that I meet traveling!). The group of friends are mostly ex-collages of the work she did in the Expo of Shanhai. Leaving Iquitos has been dificult and I know I’ll come back someday. The fast boat leave me at Santa Rosa (Peru) where I have to walk a kilometer to get the stamp out tof Peru. The tied of the amazon river is low and all the land distances increase. Once we have the stam out, we cross to the other side of the river (I’m traveling with a one couple of dominicans and a couple of english) to Leticia (Colombia), and we look for accomodation. Iquitos, the city that is more away by road of the world, is at the middle of the peruvian amazon. I always had in mind to come here in my route around south america because Isabel Sánchez (Chata for the friends from Iquitos and of the Associació Sura), she always have talk to me about Iquitos and the Associación La Restinga that do educational work at all levels in the most needed areas of Iquitos (Barrio Libre de belen) and at some communities “ribereñas” does programs to strengthen their identity and prevent a possible but almost certainly social exclusion. So folowing the indications of Isabel I go directly to La Restinga. I have two names, Puchin (the director) and Itala (the coordinator of Crea Belen project). They Both are on holidays... and I meet Carmen (a Professional of the Crea Project) and Yolita (the administrator), they give me a good welcome. Cavalls del Vent (Horses of the wind). The hike route that links the eight Refuges in the Cadí-Moixeró Natural Park.